Did you see the notice taped over the bus stop sign at the 3rd and Grand MAX Station? It’s evidence of good things to come. Really good things. – Route 142 will operate seven days a week. – Hours of operation will be extended into the evening. – Buses will run more often during much of the day. – Buses will stop at the 3rd and Grand park-and-ride lot / MAX Station for direct connections to Main Street MAX and access to Bike-Share. – Buses will operate both north and south on Grand, making it easier to find your bus for the return trip. – Buses will continue to go south through Crown Center to 27th and Grand. – And finally — Ta-Dah! – Route 142 will go all the way up to Zona Rosa. Put it all together and you have the makings of an almost guaranteed surge in ridership. This change to Route 142 represents a significant improvement in transit service for the Northland — maybe the most significant ever! What’s more, North Oak is one of the transit corridors in the region identified for major improvements with money from both the TIGER Grant (2009) and the more recent Creating Sustainable Places program. Big changes are happening on the Metro this Sunday as KCATA rolls out more of the route and schedule changes resulting from the Comprehensive Service Analysis. Check out all the changes to see how they affect you. Metro Changes. 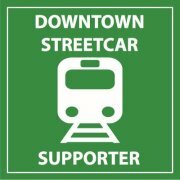 The KC Downtown Streetcar Authority meetings are open to the public. Feel free to attend and hear the discussions. When: Wednesday, Sept. 26, 2012, 11-12:30 p.m.
Where: Helzberg Auditorium, Central Library, 10th and Main, Kansas City MO. 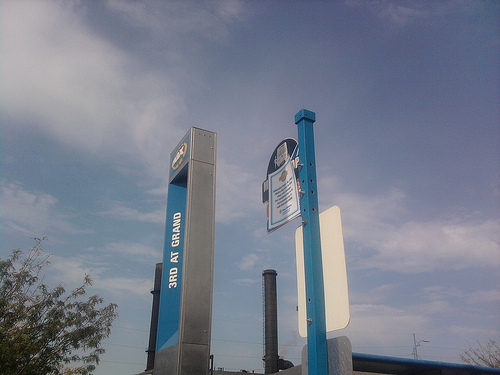 The Authority will start discussions about the fare structure and choosing an operator. This photo looks northeast from the southwest corner of I-435 (EB off-ramp) and Metcalf. Putting bus service on Metcalf — much less a premium service such as Johnson County Transit’s pre-BRT* “Connex” service — is a challenge. There is no sidewalk on the west side of Metcalf between 107th and 110th. Sidewalks are under construction along other segments of Metcalf (including the east side of Metcalf through this interchange), but there’s no evidence of it here. Not yet, anyway. Moreover, there’s no evidence — not yet, anyway — that there will be a crosswalk with pedestrian signals. This off-ramp has five lanes — three for left turns and two for right. The crossing distance is roughly 90 feet, 22.5 seconds at the 4-feet-per-second standard walking speed used by traffic engineers. For transit to work there need to be sidewalks along both sides of the transit street. That’s especially true for a BRT route where stops are a half-mile or a mile apart. In addition, there need to be good sidewalk approaches along cross streets, in addition to links to buildings that front on the transit street itself. Those are tall orders for a part of our region that was built with moving cars as the number one guiding design principle. This view looks almost empty but even at 2:51 in the afternoon there’s a LOT of traffic. And signal cycles are long: two minutes or more. Imagine waiting to cross Metcalf to catch your bus. You see it approaching in the distance, but by the time you get a WALK light and get across the street your bus has already passed. Next bus in 30 minutes, if you’re lucky. There’s no question that transit improvements being made along Metcalf using the federal TIGER (Transportation Investments Generating Economic Recovery) grant awarded to JCT in 2009 will make the corridor look more attractive, and will actually raise the visibility of transit on Metcalf. Attractive bus shelters with real-time schedule signs will be placed at stops, and traffic signal priority (TSP) will be installed to help buses get through signalized intersections quicker. Still, it’s going to be tough to give Metcalf the look and feel of a transit street. For transit to work there, Metcalf needs to be totally re-conceptualized and rebuilt south of 87th Street. Overland Park has its work cut out for it. Site of SB Connex stop at 110th and Metcalf. Preparation for NB Connex stop at 110th and Metcalf. The Johnson County Transportation Council meeting will discuss the REVISED proposed eliminations and reductions to service, effective Jan 2, 2013. A public comment section is on the agenda. Please attend and make your feelings known about the proposed changes. The council changed its regular meeting time in response to comments received about the service reductions. JCTC wants to hear from you. 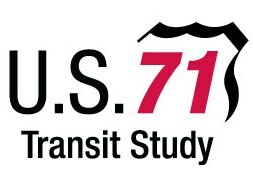 The Jackson County US 71 Transit Study, an Alternatives Analysis, started in June and is the third transit corridor to be studied as the County works to complete a transit package to put before voters. Completion is scheduled for the end of the year. There have been two Stakeholder meetings (Janet Rogers and Mark McDowell both represent TAN) and a public meeting. Until a final decision has been made for locally preferred alternatives in the three corridors, nothing can go forward. The US 71 corridor originates in downtown Kansas City, Missouri and extends south of the downtown area, terminating in Belton, Missouri. 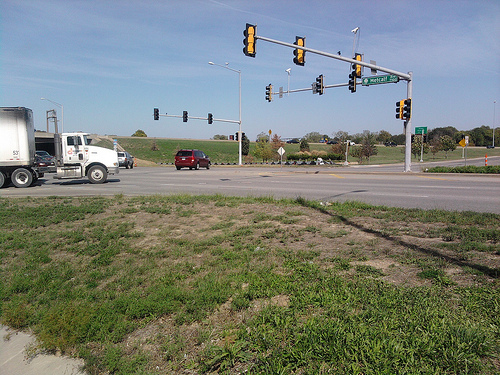 The corridor generally parallels U.S. 71 crossing Kansas City (MO), Grandview and Belton and is being evaluated as a potential addition to the Jackson County Commuter Corridors Alternatives Analysis, a transit study that has been in progress since 2011, which consists of the I-70 corridor and the Rock Island corridor. This corridor is very congested and portions of US 71 between 51st and 75th are particularly slow. Current transit service on U.S. 71 and parallel service on Prospect provide transit access for the area, but scheduled travel times are almost double the travel time of the automobile. 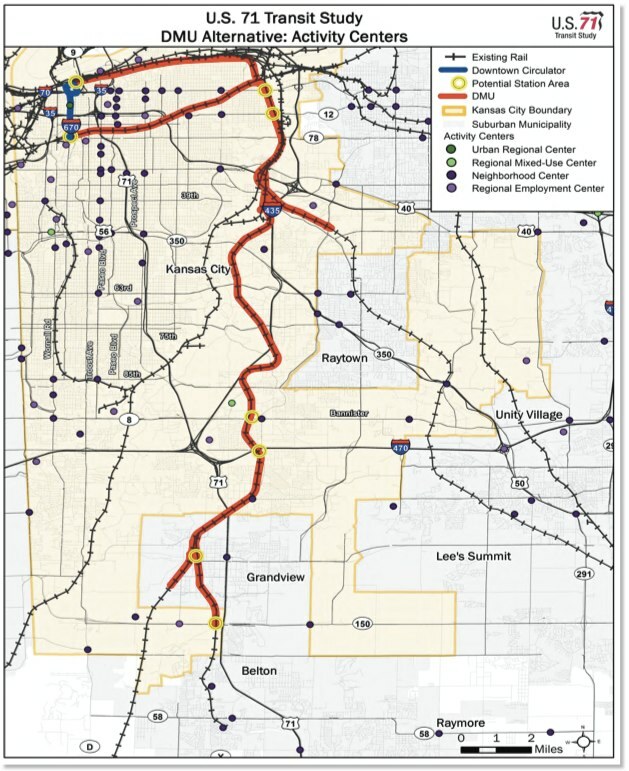 The US 71 corridor study is benefiting from the work already done in the other corridors. This study is considering Express Buses, Bus Rapid Transit (BRT), streetcars and commuter rail. Just a reminder that the commuter rail is not electrified light rail. It is a diesel vehicle, Diesel Multiple Unit (DMU), which operates on existing freight lines or new tracks. The project team, Jackson County, MARC, KCATA and Kansas City, Missouri and the consulting team, Parsons Brinckerhoff, are all the same as the previous study. The study is in Phase I, which provides the purpose and needs statement and does an initial evaluation of the alternatives to decide which ones will go through to Phase II. 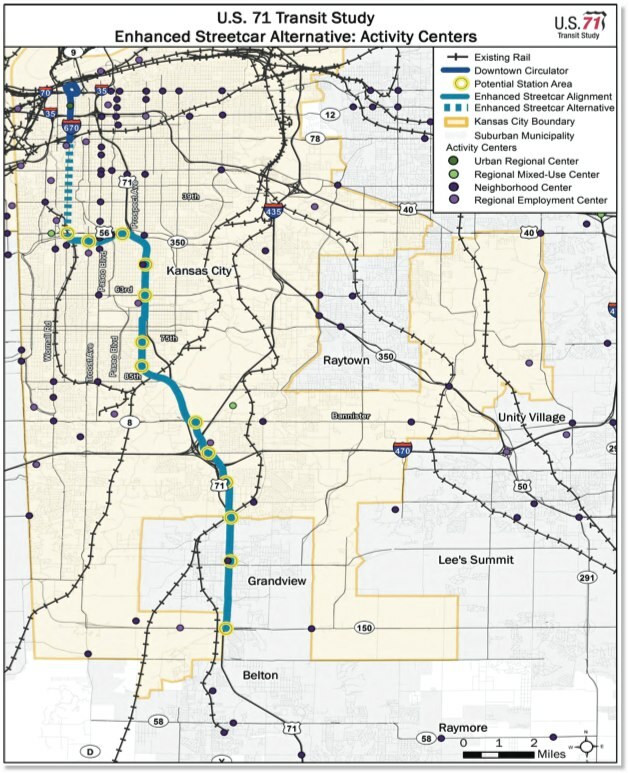 all capital improvements identified in the fiscally constrained MARC 2040 Long Range Transportation Plan (LRTP) that will be implemented by 2035.
the existing bus network augmented with the recommendations listed in the KCATA Comprehensive Service Analysis Key Corridor Network. capital improvements and bus network enhancements. 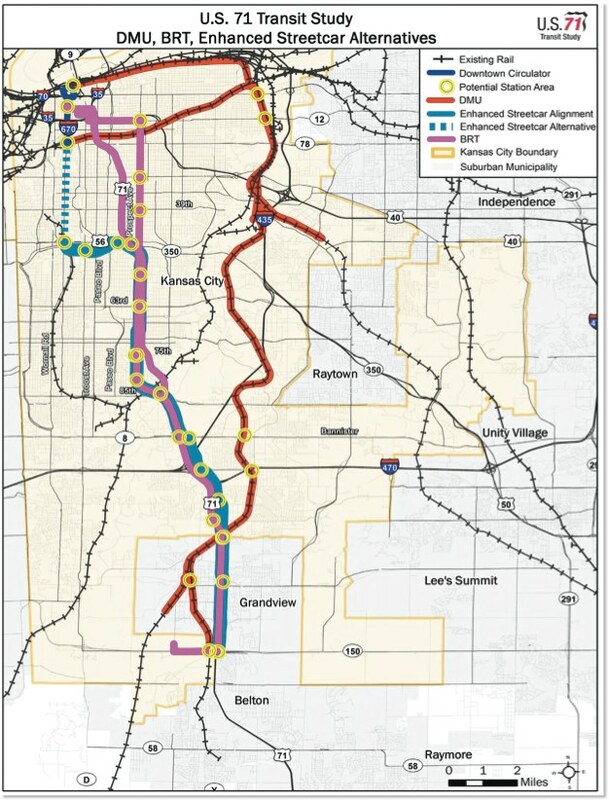 an expansion of KC Scout Intelligent Transportation Systems. Capital bus enhancements on U.S. 71 (such as bus on shoulder), which will be identified and evaluated as part of Tier 2. New intermodal transfer point in vicinity of Hillcrest and Bannister Road. Seven U.S. 71 / Prospect BRT station pairs. 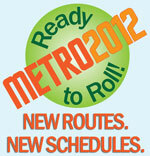 Extension of local bus service along Prospect to Bannister Road and Blue Ridge. Extension of Express Bus service (Route #471) from current terminus Point at U.S. 71 & Red · Bridge Road to U.S. 71 & M-150. The extended service would serve park and ride lots at U.S.
71/M-150 and at Truman Corners Shopping Center. Number of trips would be increased from 5 AM and 5 PM to 8 AM and 8 PM. 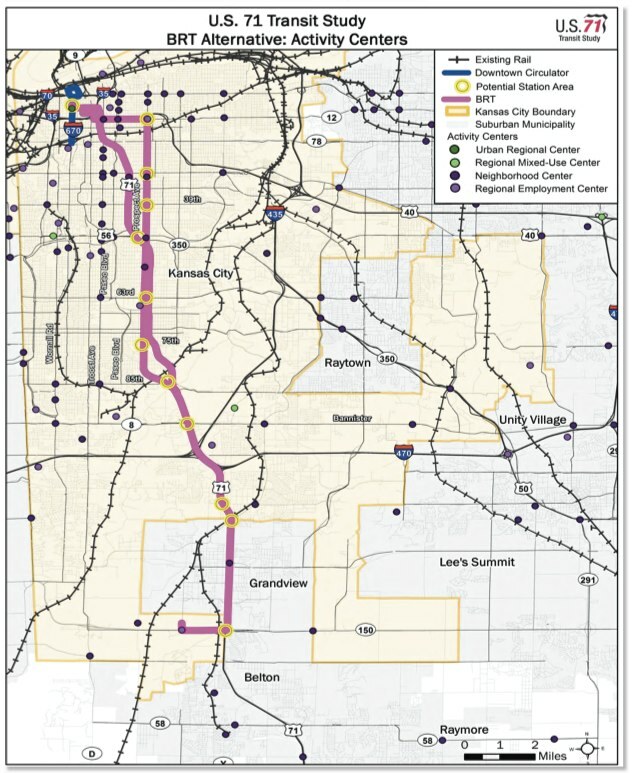 Two alignments are anticipated for the BRT alternative–a Commuter BRT on U.S. 71 and an Urban BRT on Prospect. US 71 Commuter BRT connects M-150 in Grandview with the 10th and Main Transit Center. Prospect Urban BRT connects Bannister Road in south KC with the 10th and Main Transit Center. The enhanced streetcar would serve a third phase of the KC streetcar system (phase II would be to the Plaza). The streetcar would travel on the west side of US 71 and ends at M-150. A feeder bus network would also be a part of this alignment. We expect the streetcar alternative to be eliminated because it is so expensive and probably wouldn’t qualify for federal funds to help us pay for it. We expect the projected ridership to be too low to make the line cost-effective by FTA standards. If it is advanced to Phase II it will be because the partners want to do the cost and ridership analysis for future reference. The DMU alignment crosses nearly 80 bridge structures. About 20 of those would require improvement of some kind, up to and including replacement. The stations along this alignment are limited due to various complications, including physical challenges and the lack of population and employment density. The U.S 71 corridor has a large low-income population. The ability to provide improved access to work opportunities is an important goal of the enhanced transit system. There will be additional public involvement as the study progresses. For more detail, review the information from the public open house materials and fill out the comment form.